I am taking a stroll down memory lane these days, and have decided to share some pieces here, on my blog. 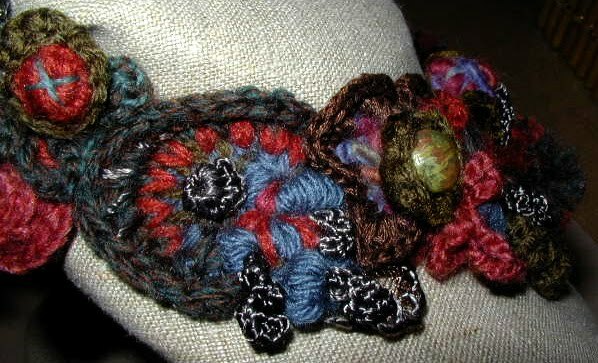 This is, by far, my most favorite piece of freeform crochet. It started out as a necklace, but then grew into more of a collar. I created it for Prudence Mapstone, as part of a jewelry exchange with members of the International Freeform Guild. I worked on it during the war in 2003. It was great to have something to focus on, and to take away the stress of hearing the frequent air raid sirens. 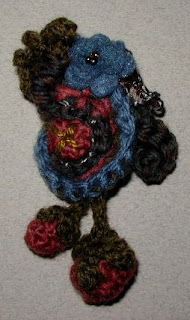 It was quite a challenge to make something for Prudence, who is a legend in the freeform crochet world! I made dozens of scrumbles for this project and only used about 1/2 of them. I find that I get the most pleasing arrangement, when I have a big assortment to choose from. The remaining scrumbles have been used to make smaller items, such as the 2 brooches pictured below, rings, and various greeting cards. I try not to let any scrumble go to waste! 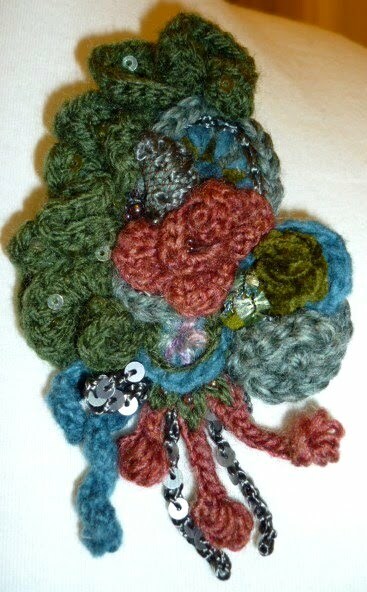 To add interest to the piece, I embellished it with beads, sequins, seashells, felt pieces, and embroidery. I also decorated some of the beads myself, by cutting small pieces of paper and decoupaging them onto wooden domes. 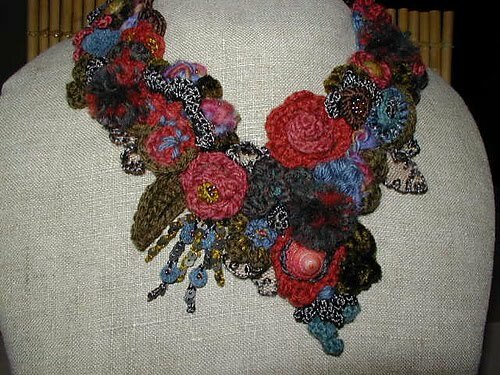 I learned a lot while creating this collar, and I believe that it was this piece that really sparked my interest in designing crochet jewelry. your work is stunning! would you mind if i 'steal' a couple pictures and blog about you on my blog? I would be honored if you blogged about me jd! Thank you for asking! Yes, you have chocolatesky! Thank you for your comment!